Make Sure You Have the BlackBerry Music Gateway as You Head Back To School! A couple months ago, I talked about how great of a gift a BlackBerry PlayBook would be for any grad! We STILL LOVE our PlayBook and use it every day! The BlackBerry® Music Gateway is a hot new music accessory that works with any smartphone and is super affordable at under $50. Music loving students and teachers can wirelessly stream to their dormitory, car or classroom stereo system from a BlackBerry smartphone, BlackBerry PlayBook tablet or any Bluetooth enabled device. Whether you sync your personal music library or stream music from one of the many BlackBerry App World music apps like BBM Music, Slacker or Pandora, you will never run out of good tunes. Once connected to the BlackBerry Music Gateway, you can use your smartphone as a remote control from up to 30 feet away from the stereo. Since the BlackBerry Music Gateway works with any Bluetooth enabled smartphone anyone in your dorm or classroom can also share their tunes. 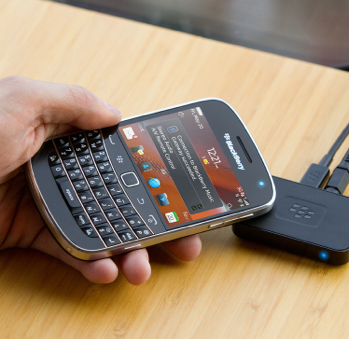 I love how small the BlackBerry Gateway is but yet how powerful it is! It can amplify the sound whether playing a car racing game like Adrenaline HD on the PlayBook or listening to an audiobook in the car. This affordable little gadget has numerous uses! We use this Gateway when I want to listen to my favorite radio stations on my PlayBook DOWNSTAIRS on our stereo and we do it ALL wirelessly! It is so cool and it makes a very unique and affordable gift for anybody who loves their smartphone or tablet! You’ve got full control over playback, change tracks, volume, and play or pause because your BlackBerry device is your remote control. Best of all, it is really easy to use! So save yourself time and hassle while listening to music and go cordless and hassle-free with the BlackBerry Gateway this school year! Buy It: You can purchase the BlackBerry Gateway for $49.95. Just visiting from welcome Wednesday! hope you can stop by & visit! now am following!